As a child, volunteering was always a prominent part of my life, and yet it was for selfish reasons. During summers, while others were busy playing in pools and soaking in the seeming brevity of precious moments, I found myself out and about, finding something to do. Yet, while the hundreds of hours I once accumulated look impressive on a résumé, for me, volunteering was a way of escaping the rat race and pressures of parents and home. It was an opportunity (as foolish as it sounds now) to feel good, make change, and be a better person. As I grew older, I began to realize the naivety of this mindset. As this subliminal, pre-instilled notion that the impact I made volunteering would somehow ripple its effects across the world shattered, I began to grow skeptical of my efforts. I began to ask the questions: Was I really needed? Was I really contributing? What did I get out of this? Cynically, I found the answer to the questions to be that while I entered with a preconceived notion of making an impact, nine times out of ten, I was nothing more than a mere peripheral gear orbiting around a cog of systems I was too tiny to see. While I once thought that my daily trips to the little care facility in the hilly slopes of Milton, Ontario, were selfless and eager, I now questioned the ethics that are the results of my actions. While I once thought that my hours sweating under the sun were sacrificial and important, I now realize I was nothing more than a busboy. Sadly, such is the truth for most forms of volunteering, even in the “developed” societies of Canada and the US. While we would like to believe that our contribution of time and effort causes an impact on the community around us, the reality is that we could be replaced. Or worse, we could be contributing harm in an unequally stacked system. Reflecting on my own actions, I questioned the impact of my visits to a medically fragile children’s palliative care center, as I, amongst the hundreds that constantly visited, served in the role of in-lieu parents for children. Guiltily, I acknowledge the excruciating emotional impact that I must have had on these children, as I was only one amongst hundreds of strangers that came and went, never truly serving as the emotional connection so deeply needed in a child’s life. To see the children there live in a life constantly bombarded with others they barely know, while only desiring to see their parents again, made me question the ethics of my actions. Was I, in all my good intent, making an impact, or was I simply grinding down their time and discouraging a better system, to satisfy my own ego? Discouraged, I began to grow seeds of skepticism that blossomed while reading the Learning Service book early on during my school’s spring break trip to Cambodia. Researching the country beforehand, I was bombarded by both streams of tacky tourism clichés and terrifying statistics about the seeming lack of “development” in Cambodia. Would we really be able to make even a noticeable indent on this community? Of course, 7 billion people have 7 billion agendas. Yet, as we try to interfere with the agendas of others and convert them to become more like our own, we realize both how implausible and how inconsiderate our actions are. Throughout the course of our trip, I read about both the exploitative and negative implications that plagued the world of voluntourism – hordes of naïve people with savior complexes and a goal to do good, flying halfway across the world for superficial work to fill their own egos. 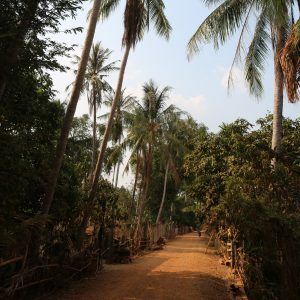 Yet, as we approached our third day on the lush, beautiful shores of Koh Pdao island, on the mighty Mekong in north east Cambodia, I felt frustrated, conflicted. Although we had come with good intentions, it is not unfair to say that we were amusingly underprepared and unfit for the job at hand. To be frank, we were a group of unskilled, hot-headed students, some of whom had never worked a day of manual labor in our lives. Ironically, being privileged enough to fly halfway across the world, we were terrifyingly abysmal at even the smallest tasks at hand; what may well have been done with a single local person, such as painting a container, in turn took five of us, while we were equally inefficient in our ventures of mixing concrete and digging lanes. As the locals gathered and looked on with amusement and a hint of pity at our efforts, I felt a tinge of connection between ourselves and all the unskilled, superficial volunteers case-studied in Learning Service. The reality was, aside from the comic relief we provided, we were untrained, low-level laborers, contributing next to nothing while simultaneously draining the community of resources to supervise, shelter, entertain, feed, train, and keep comfortable. With such a realization, I felt conflicted between an innate reaction to suppress such negativity, and a swell of frustration – at our laughable efforts, at my lack of ability to contribute more than mere physical exertion and foreign economic injections. The concept of volunteering and service abroad has been ghastly taken out of context by tourism companies – this point such should not be a surprise. However, with it comes an inherent silver lining: thousands of travelers willing, or willing to learn, to do good and diversify their perspectives. While such might not always be the case, oftentimes travelers do bring an alternate source of economic benefit to the community. For instance, our stay in Koh Pdao has had a mutual benefit in allowing us – the travelers – to live with a roof over our heads, while simultaneously empowering, people, predominantly women in the community, to have more economic freedom by providing those services (e.g. the people who let us stay in their homes, the people who cooked for us). Likewise, with proper implementation, volunteering can allow organizations to complete locally-run ventures more efficiently and sooner, rather than eliminate the jobs of locals. For instance, in our project of building a water reservoir, although we may have been inefficient, 15 students and 3 locals worked a total 8 hours instead of 8 locals doing the same, unpaid, job. With that said, a global attitude shift on the portrayal of foreign communities must change. While currently, with countries labeled as “requiring aid”, we are consequently bombarded with images of unsanitary conditions, poverty, and the like. Psychologically, a stereotype of the country is embedded into our heads, followed by a mentality of fearing the unknown. However, although what is being portrayed may be a reality in some circumstances, many inhabitants of the world hold attitudes towards life that are inherently different from our own. For instance, while the lack of possessions may signify to us a sign of poverty, in many parts of the world less influenced by the widespread use of corporate advertisement, materialism is simply not considered a worthwhile pursuit in life. While it may be difficult to get our heads around it, the concept of “living” and the values that it dictates, and “happiness” are immensely different based on culture. This includes the meticulous details in our trains of thought, such as the need for comparison between self and others that causes materialistic attitudes. What we need to do is instead view different cultures as equally valid, and focus on mutually accepted goals for human rights, equality, and safety rather than try to convert others to be more like ourselves. Quoting the words of a travel website: “teach English to monks in the mountains of Nepal”. But while a child living in a western environment may certainly need English, what good does English do to those living a life totally different from our own? A topic you should be familiar about by now – travel to learn rather than to change. Lastly, while I won’t pretend that my short-lived, memorable 2 weeks in Cambodia somehow “changed my life” or “broadened my perspectives on issues facing …” (phrases all too often heard in university applications and social media posts alike) those 2 weeks were spent with some of the most genuine and caring people in this world. What the trip did teach me was the importance of learning before acting. Fortunate to say, my guides Claire and Yut were some of the best role models of my life, and their thinking, positivity, mindset, and lessons resonated with me. Of these, the singular, most memorable lesson is that of learning before you make change. On our trip, before diving into a service project, we chose instead to spend days learning about the fascinating country of Cambodia, dissecting the word “culture” into its components. Certainly, while differences in topics such as language and food are apparent, it was only through a thorough education on Cambodia’s history and current issues, that we were able to more holistically understand both the reasons for service placements, and pinpoint the amazing plus-points of the country. We spoke with NGO organizers on issues such as the country’s social and economic visions and challenges, gender inequality, empowerment of youth through technology, traditional mindsets and visions for life, and viewpoints on both familiar and world issues. And we did group activities exploring the drastic wealth stratification within the world. For me, the Cambodia trip was a fascinating opportunity to observe the history, culture, and people of the country, as well as an opportunity to learn, and an opportunity to immerse myself into their lives – even if for a brief time. What the Cambodia trip did do, however, was far more than just broaden my perspective: it taught me an essential mindset. What I learned on this trip was less about doing things, but more about the mindfulness, self-reflection, and humble lessons I have taken away from a society far more than the North American stereotype of a “poor country”. While I certainly didn’t learn about every element of Cambodian culture, it provided me with a lingering gift and craving to learn. To take everything in, instead of being in a hot-headed rush to do change the world. Reflecting upon myself, I now fully realize my naivety, and this story is a story of my journey of thinking throughout the trip and beyond. On a final note, as a 16-year-old, humbly, please take any pessimism and lessons I have taken here with a grain of salt, and I deeply respect other perspectives and ask you to share your viewpoints and opinions on this post. As a last word, certainly, there is more to learn, however, the future generation of volunteers are bright and optimistic, ready to take in and take on the world! 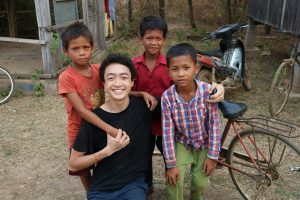 Daniel Ma is a grade 10 student currently attending Appleby College in Oakville, Canada, where he recently went on a trip to Cambodia with the educational travel company Where There Be Dragons, opening his eyes to the fascinating potential of volunteer tourism (If done correctly). 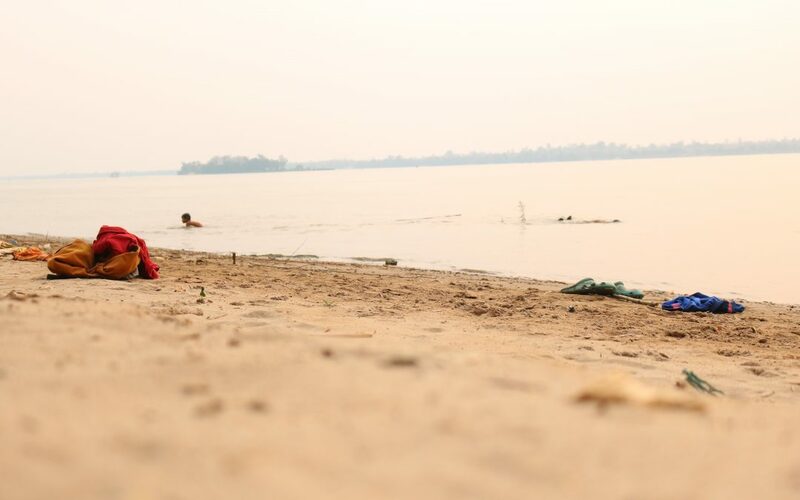 In Canada, Daniel is an avid participator in volunteer initiatives, photography, and international councils such as Round Square, which sparked his motivation to travel in Cambodia!The featured image shows the beach of Koh Pdao island. Wow, that is such a great perspective, thanks!